Classic Shaving is a leading men’s purveyor of traditional shaving kits and a proud supporter of traditional wet shaving methods. Its products, which range from razors, brushes, mugs, toiletries, and other grooming items, are made of high-quality, durable materials. Classic Shaving works hard to provide excellent customer support and advice for those interested in shaving with the timeless straight razor. To take their website to the next level, Classic Shaving selected EYEMAGINE, a Magento Gold Solution Partner, to implement a complete website redesign and upgrade their site to the Magento Enterprise Edition platform. 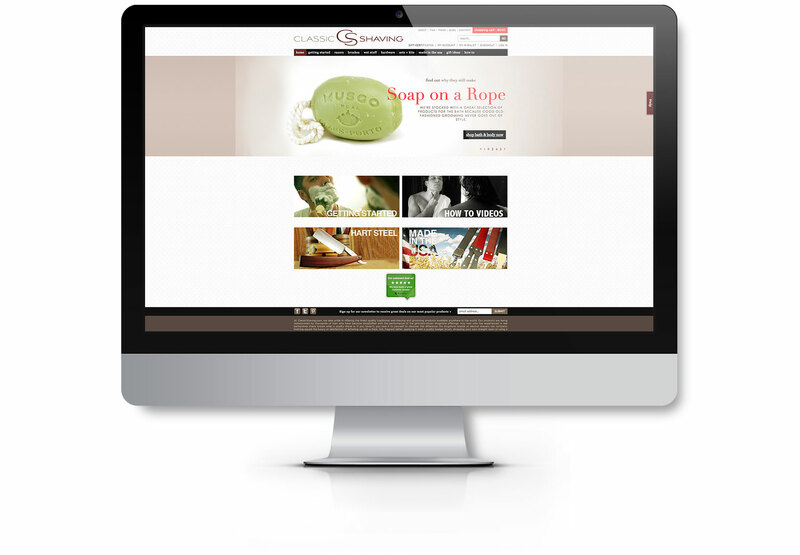 EYEMAGINE designed a distinct and visually stimulating user experience (UX) for Classic Shaving using industry-leading eCommerce web design techniques. Classic Shaving’s previous site was largely outdated, featuring a lengthy navigation sidebar in which product tabs had to compete with each other for attention. 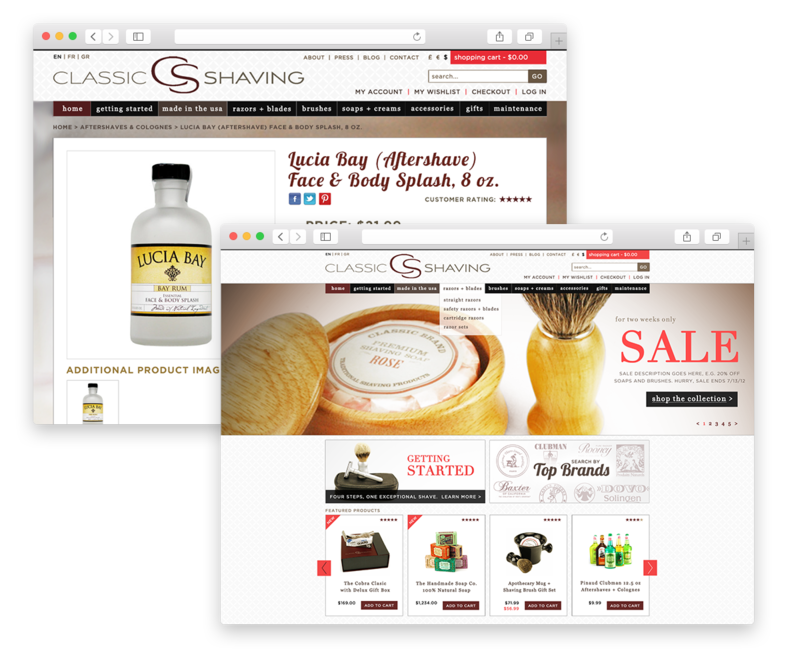 EYEMAGINE improved this, allowing users to access Classic Shaving’s offerings through an intuitive, clean homepage navigation bar that hosts a drop down menu displaying product sub-categories. Further, EYEMAGINE developed a slider on the Classic Shaving homepage that linked stimulating images to featured product collections. The slider dramatically reduced the amount of text and increased the aesthetic appeal of the company’s homepage. EYEMAGINE led us through a technically-tricky website transition with grace and intelligence. EYEMAGINE provided rock-solid support through a potentially tumultuous website migration and backed us up 24/7 - weekends included - until our site was performing above and beyond expectations. EYEMAGINE moved our entire business from our old website to a beautiful new one in real-time without missing a beat. EYEMAGINE’s implementation of Magento Enterprise Edition immediately improved and renovated Classic Shaving’s order fulfillment system and increased the accuracy of inventory management - especially in the case of products that span multiple categories. The upgrade to Magento Enterprise Edition also enabled Classic Shaving to use a paperless automated system that streamlined their order fulfillment process. With this new system, administrators could easily update orders, identify expedited shipping orders, identify and track payments, print packing slips, and automate sales tax calculations. Further, they could ensure that all transactional information is safely captured and organized for timely order fulfillment. This website redesign only marks the beginning of the relationship between Classic Shaving and EYEMAGINE. The EYEMAGINE team continues to maintain the Classic Shaving site, making sure that the company’s online store is as cleanly groomed as its customers.